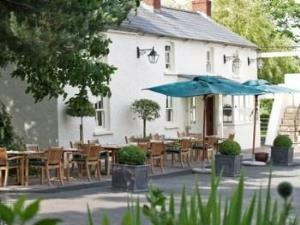 The Walnut Tree01873 852797work RestaurantThe Walnut Tree Restaurant sits on the B4521, two miles East of Abergavenny, and has been a famous inn and restaurant since it began in the early 1960’s. It is now run as a joint venture between Shaun Hill and William Griffiths. The Walnut Tree offers proper dining and drinking in an informal setting; for a glass of good wine with a plate of something, through to a full lunch or dinner! The Walnut Tree Restaurant sits on the B4521, two miles East of Abergavenny, and has been a famous inn and restaurant since it began in the early 1960’s. It is now run as a joint venture between Shaun Hill and William Griffiths. The Walnut Tree offers proper dining and drinking in an informal setting; for a glass of good wine with a plate of something, through to a full lunch or dinner! The menu is an eclectic mix, based on personal taste and sound cooking techniques, rather than any particular country's cuisine. A unifying feature is a core of excellent ingredients, local where feasible and carefully chosen. No dress code or similar pomposity.